Each year, on the second weekend in July, Stonehaven host a Folk Festival at local venues such as the Town Hall, St Bridget�s Hall, British Legion, Market Square, Open Air Pool and various Hotels in the town. Throughout the years, since 1989, the Stonehaven Folk Festival has attracted some top folk singers, folk bands and groups. In addition to live performances visitors can attend workshops to learn musical instruments such as the fiddle and can even take part in the paper and comb championships or watch fun events like the aqua ceilidh. 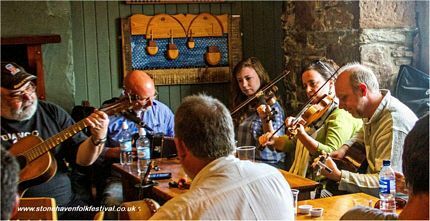 The Stonehaven Folk Festival 2017 takes place from 6 to 10 July. Guests include Jarlath Henderson Band, Mike McGoldrick and Friends and the John McCusker Band. The Chorus Cup is a fun event and each year it is awarded to the performer who can get everyone in the pub to sing along to their performance. Previous acts and musicians have included Eddi Reader, Scottish singer Barbara Dickson, The Battlefield Band, Dany Cooper, Cabrach, Michael Marra, Mike Silver, Idiot & Friend, Rachael Unthank and the Winterset, Stanley Robertson, Rallion, Paul Lamb, Johnny Dickinson, Kate Rusby, Aly Bain and Phil Cunningham, Giveway, Wolfstone, Reel Estate Ceilidh Band, Archie Fisher, Kristine Olsen, Black Umfolosi 5, Saltfishforty and Wingin' It!